We are happy to announce that we’ll perform at Hall Of Fame in Wetzikon, Switzerland on November 4th together with Emerald and Within Silence! 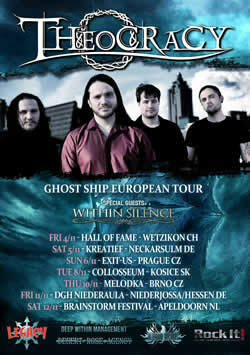 Check out the flyer or check the tour section for more info and ticket links. 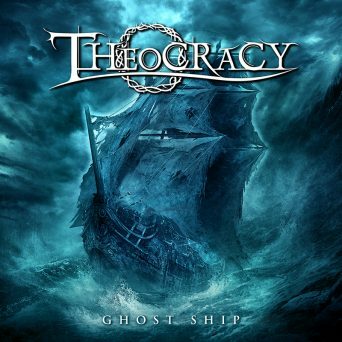 The Athens, Georgia-based melodic metal band THEOCRACY will release their new album “Ghost Ship” on October 28th in Europe and North America through Ulterium Records. Information on different editions and formats will be announced soon. We’re happy to announce that we’ll return to Prague, Czech Republic on November 6th! We hope to see many of you at EXIT-US! Check out the tour section for more. We are excited to present a BRAND NEW charity song that Matt wrote and sang & played on! All proceeds go to feed homeless and refugee families in Greece. Watch the studio video featuring Matt and several of our other favorite musicians from Rob Rock, Vandroya/Soulspell, Sunburst, LEAH, etc., and follow the links in the description to purchase. Enjoy!! Join Matt (and special guest(s?)) on a quick tour of the farmhouse-turned-makeshift-studio used for recording drums for the upcoming fourth Theocracy album.